CHARLOT SALWAI TABIMASMAS, Prime Minister of Vanuatu, expressed his country’s concern about the vast flows of refugees and migrants, noting that in 2016 the number of displaced people around the world stood at 65 million. An exodus to cities and a high rate of urbanization was a challenge as well. There was a clear link between forced migration and the responsibility to protect. As a small island developing State facing rising sea levels, Vanuatu appealed to the international community to consider a legal framework to address the issue of climate change refugees. 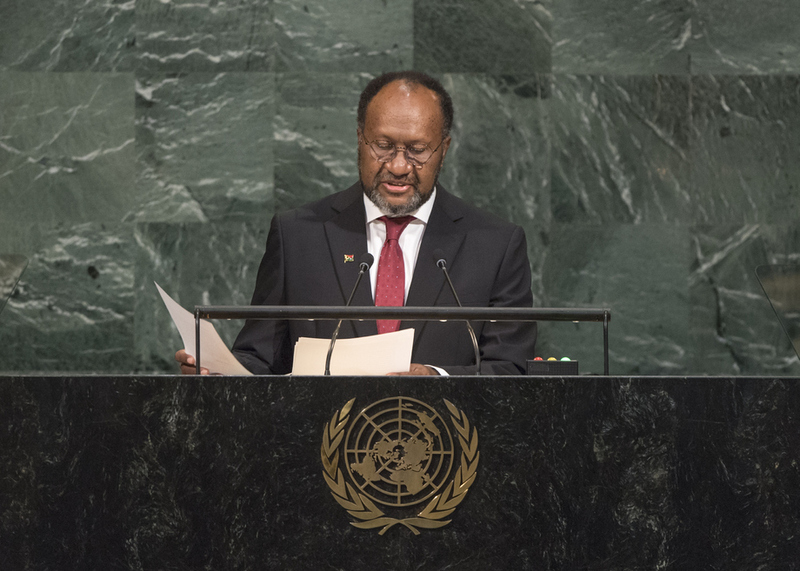 For Vanuatu, the United Nations represented the best hope and catalyst for peace and security, as well as for lifting millions out of poverty, he said. To remain relevant, however, strategic reforms were needed. Being a permanent member of the Security Council was a responsibility and it was incumbent on the organ to move beyond the political interests of its members and to find compromise solutions. Vanuatu supported Council reforms which reflected current geopolitical trends with fairer regional representation, he said. Vanuatu’s graduation from least developed country status did not eliminate its vulnerability to natural hazards, nor must it upset or hinder its development, he said. The transition mechanism for graduating countries must be strengthened. Conveying his Government’s concern about threats to peace and security in the Asia-Pacific region, he urged the Democratic People’s Republic of Korea to halt its missile and nuclear development programme, reaffirmed Vanuatu’s commitment to the denuclearization of the Pacific and welcomed the Treaty on the Prohibition of Nuclear Weapons. Hurricanes and tropical cyclones around the world were warnings from Mother Nature that climate change was happening faster than efforts to respond to it, he said. Deeper thought and greater efforts were needed. Reducing greenhouse gas emissions would make a difference, he said, urging the United States to review its decision on the Paris Agreement and to implement it. He emphasized his country’s commitment to reverse the decline of the health of the world’s oceans, including through a ban on plastic bags by 2018. Looking ahead to the 2018 referendum in New Caledonia, he urged the administration there to honour the will of its people. The Human Rights Council should meanwhile address the situation in West Papua, he said, calling for decolonization to be put back on the United Nations radar. Speaking in exercise of the right of reply, the representative of Indonesia responded to Vanuatu.